Based on some reviews, the Merrell Trail Glove 4 is more protective and stylish than the previous version. A lot of runners said that this shoe performed well on short and long-distance trail runs. According to some testers, the tongue unit and the laces are more comfortable and secure. Some of the fans of the series mentioned that this version is really visually appealing. A good number of reviewers appreciated this shoe because it fitted like a glove. Most of the testers mentioned that the formal style of the Merrell Trail Glove 4 allowed them to wear this shoe for casual occasions. A lot of runners agreed that the Merrell Trail Glove 4 was more flexible when compared to other shoes. Some users felt some pain when they initially started wearing the shoe. According to some testers, the mesh was very thin. It easily tore apart after only several uses. A few runners mentioned that the shoe felt a bit loose in the ankle. Some runners observed that the outsole had a flimsy grip on muddy trails and slimy rocks. Many claimed that the Merrell Trail Glove 4 is one of the most appealing shoes that a runner could ever have. A lot of testers admired the flexibility, slip resistance, construction and durability of the shoe. Trail Runners recommended the Merrell Trail Glove 4 because of its appealing and stylish look. They also commented that the shoe performed fairly well on short and long trail running sessions, with minimal pain at the start of wearing the shoe. minimal trail running shoe, and barefoot trail running shoe. Most people are not ready to go into a full-fledged barefoot running shoe, especially for trail running. The Trail Glove is a good compromise as it has a barefoot feel, with more protection. The upper is made of a lightly padded synthetic material. There is a lattice of overlays around the midfoot to add structure and support. The Trail Glove is very breathable for a trail shoe. There are no holes in the upper for ventilation, but the upper material itself is breathable. This is favorable because the upper does not let trail debris into the shoe at all. Since this is a minimal shoe, Merrell does not include a heel cup. The heel collar has a small amount of padding. I would not want any more padding in a minimal running shoe. Gloves do not have tongues; they are a piece of fabric that wraps around your hand. The tongue of the Trail Glove is the same material as the rest of the upper. The tongue is asymmetrically constructed; it only separates from the rest of the upper on the lateral side of the shoe. The laces are standard flat laces that allow you to get a good lockdown, despite the wide fit. The toe bumper is not the most protective of toe bumpers, but a large toe bumper would be unnecessary because you need to watch where you are going anyway when you are running in a minimalist running shoe. The Trail Glove 4 has a wide fit. The heel and midfoot are a little wide, and the toebox is very wide. The width is very comfortable. My toes can splay naturally when I land, and my feet don’t slide forward, despite the wide fit. I wear a size 12 in the Merrell Trail Glove. Here is a chart to compare the General size of different brands. The Trail Glove has one small piece of reflective material on the tongue. The Trail Glove has a very minimal midsole. There's only mere millimeters of cushion. The midsole provides very little impact protection. There is no sock liner in the Trail Glove. This makes the Trail Glove ok for running sockless. As expected, the Trail Glove has no heel to toe drop. This is ideal for barefoot running shoes. Despite the zero drop construction, there is more cushion in the heel than in the forefoot. The Trail Glove is extremely flexible. This gives the Trail Glove a more natural ride, which is what I am looking for in a barefoot trail running shoe. The Trail Glove’s outsole is constructed by Vibram. The outsole is very durable and provides decent traction. It has shallow, yet aggressively shaped lugs, that perform well on packed trails and rocks. I did not have great traction in loose mud and dirt. The lugs in the forefoot are backward for enhanced traction during climbs. The lugs in the rearfoot are pointed forwards for enhanced traction on descents. Barefoot shoes should not have good traction in loose mud, or else the sole is too substantial, and the shoe is not really a barefoot shoe. You can't have a La Sportiva Bushido sole (very Grippy Sole) on a barefoot shoe! The Merrell Trail Glove has the best traction out of any barefoot trail running shoe on the market. The Trail Glove 4 weighs about 8 ounces. This is not as light as some barefoot trail running shoes, however, it does not weigh you down in any way. Both the upper and the outsole are very durable. Over time, the lugs will wear down, especially if you run on the road. However, if you are willing to run with worn down lugs, the Trail Glove will last about 600 miles. The Merrell Trail Glove is the most comfortable minimalist trail running shoe on the market. I recommend it to anyone looking for a barefoot trail running shoe with more protection than usual. This is a very minimal shoe. Only forefoot strikers should try running in this shoe. Biomechanically less efficient runners should not attempt to use this shoe. They will quickly injury themselves. I can use this shoe for runs up to about 15 miles, at which point, I wish I had some more cushion. The Merrell Trail Glove can be used on roads, but the more substantial outsole is heavier and not necessary on roads. The Vapor Glove is the more minimal version of the Trail Glove. It has no cushion at all and a much less substantial outsole. The Vapor Glove is technically a trail shoe, but I find that it works best as the road version of the Trail Glove. Both shoes are zero drop and equally comfortable. Buy the Vapor glove if you want a full blown barefoot shoe; Buy the Trail Glove if you want a little bit more protection. The Trek Ascent is another barefoot trail running shoe. The Trek Ascent is two ounces lighter than the Trail Glove. Both the Vibram Trek Ascent and the Trail Glove have durable Vibram outsoles (no surprise there), however, the Trail Glove’s outsole is more substantial. The Trail Glove looks like a normal shoe, unlike the Trek Ascent, which has 5 toe pockets. The Trek Ascent has a much more secure fit. the Trail Glove. In over 50 miles of testing, I never had any problems. The shoe could definitely be a little lighter, but apart from that, it is just perfect. It is truly the most comfortable, "almost barefoot" trail running shoe on the market. I have to admit I was a little apprehensive about the Merrell Trail Glove 4 when I pulled them out of the box. They were exactly what I wanted: light and flexible with a durable Vibram sole to keep out rocks and provide traction. However, based on my previous experience with a pair of Vibram V-Run, I had my concerns about support. Slipping them on, I noticed the new wraparound tongue and immediately enjoyed the way in envelops your arch. With my initial fears dispelled, I took a quick walk around the room and was impressed with the snug fit that did not inhibit the natural movement of the foot. The toe box was also noticeably ample compared to traditional running shoes. Now, after a month on the trails, I have to say that I am a big fan of these shoes. The Vibram TC5+ outsole surpasses expectations of traction and durability, not surprising as Vibram excels in its construction of quality soles. The Trail Protect Pad does an excellent job of keeping the foot protected at the expense of a true barefoot feel, but the enhanced ride of the shoe is well worth the sacrifice. Since the midsole is stitched into the shoe I couldn’t “look under the hood” or test out individual aspects of the shoe as I like to do, but the molded EVA foam midsole is a welcome upgrade from the bare minimum feel of a Vibram Five Finger midsole. The cushion is not what you’d require from a traditional support shoe, but the additional responsiveness compensates you adequately. That said, I’d stick to the trails for long runs if you have a need for more support. The mesh upper delivers improved breathability exactly as you might expect, though the TPU overlays feel like they might be the weak point in the armor of this shoe. The inner side of the shoe has some durable nylon straps so no worry about broken eyelets on that side. Functionality aside it's an absolutely beautiful shoe with an attractive design that successfully incorporates aesthetics into a hard working shoe. 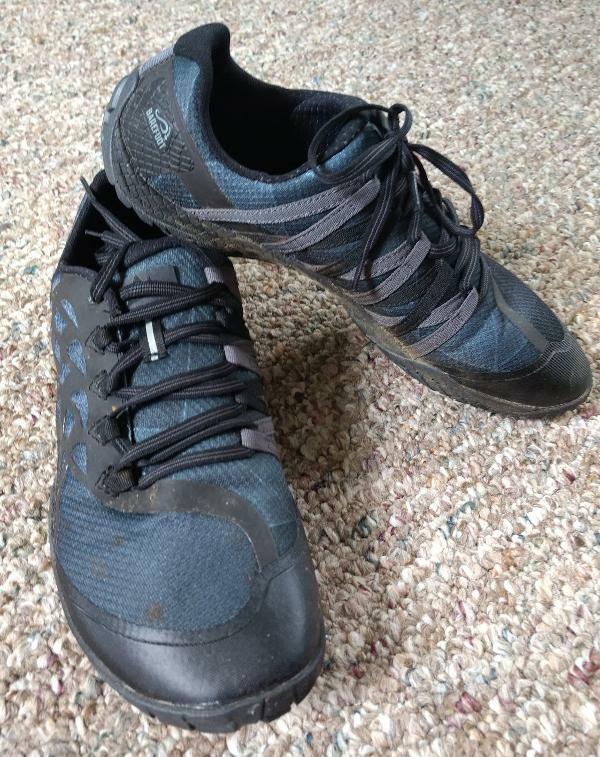 As for the overall ride of the shoe, after logging a few runs on different types of terrain (road, cinder, wooded trail, stony trail), I’d definitely say these shoes excel in a groomed or well-worn trail situation. Traction is fantastic, support is adequate but running on roads or mountain trails will take further practice with my sub-par form. If you’re already a seasoned barefoot runner, however, I’d say these shoes are a must for the rotation. If you want to explore barefoot running, the Merrell Trail Glove 4 is the shoe for you. Stick to nice trails while your body adapts and cut back the mileage. This is a great transition shoe that should last with proper care. Experienced trail runners may find this shoe a little too light compared to North Face series, but it's certainly a step up from the Vibram Five Fingers in terms of support and protection. For an enjoyable run in less than extreme conditions, be sure to check this shoe out. Setting the scene, up Crib Goch in Snowden, slippery rock, road sections, a little grass, low cloud cover, scrambling, some light rock climbing with scree and some heavy descents. The Merrell Trail Glove 4 proved to tackle all of the above. With the tenacity to stick to any substance underfoot. Trust in every placing tackling the ever-changing welsh summer weather. With a reputation for outstanding wearability the Vivovibram tread to back up any claims, they didn’t disappoint. Quality oozes from these reasonably priced trail shoes. As a forefoot runner, the annihilation of the toe box stitching or forefoot tread is usually a matter of time. Two months in and around 200k including 10 peaks, there are no signs of any wear to the outer material and very little to the tread. These shoes were built for summer abuse on firm, slippery, rough terrain it would seem. 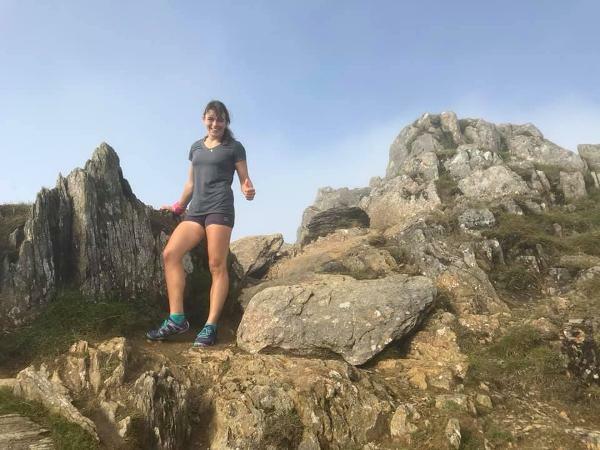 Without a doubt the summer shoe, the lugs on the Glove 4 are minimal and although proved more than capable on rocks and a slippery top surface on grass, trail, beach and fell running they are not a mud running or winter shoe. With a very minimal lug, traction in the deep ground or on a grass surface with prolonged rain and cut to the profile there would not be much grip. They drained very well in rain and beach running, drying out in rain and cloud exceptionally fast. The Glove 4 is minimal in every sense of the word, with a low drop of zero, a wider toe box allowing the toes to do their job and a low ankle. The laces which I’ll admit did nearly put me off when purchasing them proved to be one of the best features allowing for them to slip on and off in fact like a glove, living up to their name. The Merrell Trail Glove 4 is incredibly comfortable. From 5k speed sessions to 30k mountain scrambles, they seemed to relish the challenge and gave me huge confidence in them. They are a go-to shoe for utter comfort. You can tuck these anywhere with ease for a trip abroad, lightweight, flexible and durable. Definitely a good minimalistic shoe. While this is the Trail version, I find it's ideal for Road use as the outsole is not aggressive, and I prefer it over the Merrell Road Glove. The Merrell Trail Glove 4 is a trail running shoe that always connects runners to the trail. It features a zero-drop stack height with a 3-mm lug depth to enhance traction in a light setup. It has a breathable mesh lining that promotes a healthier foot environment. It also features a traditional, five-piece lace system for added security to the runner’s foot. One of the greatest changes to this version is the tongue. The half burrito tongue is not separated but rather a continuation of the upper. The Merrell Trail Glove 4 has a standard running shoe length when it comes to sizing. This shoe is best for runners who prefer minimal trail running. Available widths are D-Medium for the men’s version and B-Medium for the women’s version. The aggressive Vibram TC5+ outsole of the Merrell Glove 4 aims to provide runners with a more responsive, durable and flexible running experience. It consists of a lightweight rubber material that is abrasion-resistant. It also provides a better grip for runners. The same outsole material is used in the new Merrell Glove 5. Between the midsole and the outsole of this shoe is a Trail Protect Pad that is designed for better underfoot protection from rough and sharp objects like debris and rocks. It distributes pressure while maintaining minimal forefoot flexibility. The midsole of the Merrell Trail Glove 4 is made up of a compression molded EVA foam that provides light and long-lasting cushioning. The EVA was chosen because of its lightweight qualities that allow runners to feel light on their foot. The Non-Removable Microfibre Footbed utilizes M-Select Fresh. This is an anti-microbial agent that keeps the runner’s foot cool, healthy and dry. This solution is helpful in eliminating odor-causing microbes and preventing perspiration. The synthetic mesh upper of the Merrell Trail Glove 4 is strategically designed for durability and breathability. A breathable mesh lining aids in the absorption of sweat and moisture. It is also geared towards maintaining the ventilation of the shoe. It has a roomy toe box which is ideal for the runner who has a wider foot. This gives the runner’s toes enough space to spread out and circumvent over-crowding. The TPU overlays have been added to key areas to provide support where it is most needed. It extends from the eyelets for greater upper reinforcement and increased durability. The overlays provide a lightweight structure to the shoe. It has a lightly padded collar and tongue. These sections hold the foot in place and provide some cushioning.